WASHINGTON, D.C., Sept. 15, 2017 — The world of nanosensors may be physically small, but the demand is large and growing, with little sign of slowing. As electronic devices get smaller, their ability to provide precise, chip-based sensing of dynamic physical properties such as motion become challenging to develop. An international group of researchers have put a literal twist on this challenge, demonstrating a new nanoscale optomechanical resonator that can detect torsional motion at near state-of-the-art sensitivity. Their resonator, into which they couple light, also demonstrates torsional frequency mixing, a novel ability to impact optical energies using mechanical motions. They report their work this week in the journal Applied Physics Letters, from AIP Publishing. "With developments of nanotechnology, the ability to measure and control torsional motion at the nanoscale can provide a powerful tool to explore nature," said Jianguo Huang from Xi'an Jiaotong University in China, one of the work's authors. He is also affiliated with the Nanyang Technological University and with the Institute of Microelectronics, A*STAR in Singapore. "We present a novel 'beam-in-cavity' design in which a torsional mechanical resonator is embedded into a racetrack optical cavity, to demonstrate nanoscale torsional motion sensing." Light has already been used in somewhat similar ways to detect the mechanical flexing or "breathing" of nanomaterials, typically requiring complex and sensitive coupling to the light source. This new approach is novel not only in its detection of nanoscale torques, but also in its integrated light-coupling design. Using a silicon-based nanofabrication method, Huang and his team designed the device to allow light to couple directly via an etched grating to a waveguide configuration, called a racetrack cavity, in which the nanoresonator sits. "As light is coupled into the racetrack cavity through a grating coupler, mechanical torsional motion in the cavity alters the propagation of light and changes [the] power of output light," said Huang. "By detecting the small variation of output light, the torsional motions can be measured." Beyond just detecting torques on their micron-length lever arms, the resonators can also affect the resulting optical properties of the incident signal. The torsional frequency of the mechanical system mixes with the modulated optical signals. "The most surprising part is that when we modulate the input light, we can observe the frequency mixing," Huang said. "It is exciting for frequency mixing since it has only been demonstrated by flexural or breathing modes before. This is the first demonstration of torsional frequency mixing, which may have implications for on-chip RF signal modulation, such as super-heterodyne receivers using optical mechanical resonators." 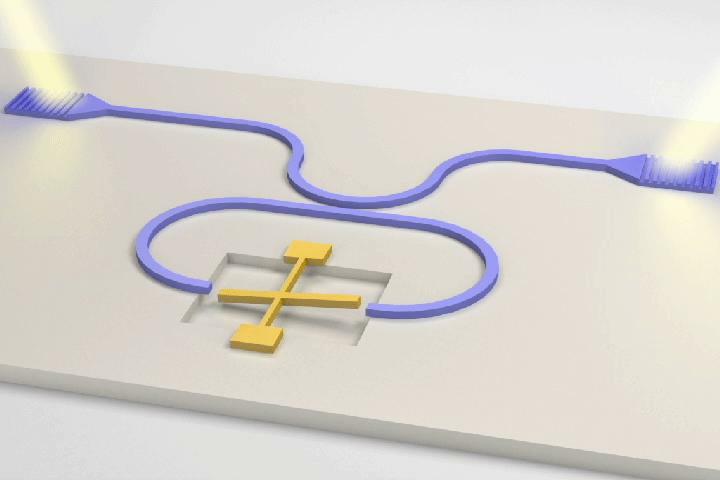 This is just the start for potential uses of torque-based nanosensors. Theoretically, there are a number of frequency tricks these devices could play for signal processing and sensing applications. "We will continue to explore unique characters of this torsional optomechanical sensor and try to demonstrate novel phenomena, such as inference of dispersive and dissipative optomechanical coupling hidden behind the sensing," Huang said. "For engineering, magnetic or electrically-sensitive materials can be coated on the surface of torsional beams to sense small variations of physical fields, such as magnetic or electric fields to serve as multifunctional sensors." The article, "Torsional Frequency Mixing and Sensing in Optomechanical Resonators," is authored by Jianguo Huang, Hong Cai, Yuandong Gu, Lip Ket Chin, Jiuhui Wu, Tianning Chen, Zhenchuan Yang, Yilong Hao and A. Q. Liu. The article appeared in Applied Physics Letters on September 12, 2017 (DOI: 10.1063/1.4986811). It can be accessed at: http://aip.scitation.org/doi/full/10.1063/1.4986811.